8 spherical-shaped coral of 0.33 in. Worldwide 48h to 72h. USA: 48h to 72h. Each Coral size: 7mm wide and 9mm long. Main Stone Coral. Stamp: 14k. Style Stud. Earrings size: 10.40mm (approx. 7/16") wide and 11.15mm (approx. 7/16") long. Earrings weight: approx. THIS PRETTY PAIR OF PINK CORAL EARRINGS HAVE A DROP LENGTH OF APPROX. EACH EARRING HAS 6 BEADS WITH AN APPROX. SIZE OF 3.0 X 6.5 MM. STUD STYLE WITH BUTTERFLY BACKS. TOTAL WEIGHT OF PAIR IS 1.4 GRAMS. CONTAINS: OVAL CORAL. KARAT GOLD: 14K YELLOW GOLD. GEMSTONE WEIGHT: 2CT. Coral size: 8.2mm wide and 10.50mm long. Stamp: 14k. Earrings size: 12mm (approx. 1/2") wide and 14mm (approx. 9/16") long. Earrings weight: approx. 3.70 grams. Diamond: 56pcs. The coral gemstones have natural color zoning and are set in 14k yellow gold. The pair weighs 3 grams. If you like this unique item, don't hesitate. Material / Materiale18k yellow gold - Oro giallo 18 kt. Delma Oro di Accardo Edoardo. /// /// ///. REGOLE SULLA RESTITUZIONE. Il costo cambia a seconda della zona. 2 tulip-shaped coral of 0.35 x 0.24 in. - 4 tulip-shaped coral of 0.22 x 0.16 in. - 3 spherical-shaped coral of 0.12 in, Ø. Both earrings 750 stamped. USA: 48h to 72h. Color enhance (dyeing). Origin, South Sea. The earrings are made from solid 18k yellow gold and features both diamond and coral gemstones. The diamonds are round cut and total approx.08cts and have SI1 clarity and H color. 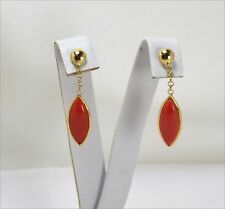 » 18k yellow gold diamond and coral drop dangle earrings ( SFLmaven ). 9ct Gold Coral Stud Earrings. 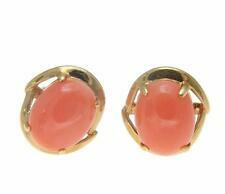 Pretty natural oval Coral stud earrings in solid 9ct gold, with diamond cut edging. These are real 9ct gold (NOT plated, rolled or filled gold) and are marked 375. Supplied in a luxury Gift Box. Stamp: 14k. 14k gold ball size: 3.85mm. Earrings size: 5mm (approx. 3/16") wide and 22.80mm (approx. 7/8") long. Earrings weight: approx. 9ct Gold Coral Drop Earrings. 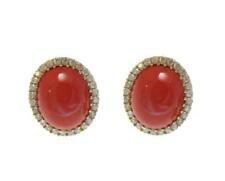 Classic Coral drop earrings, with a solid 9ct gold diamond cut surround. This does not affect your statutory rights. As a result, Asia dyes and puts on the market tons of previously harvested white coral to imitate the more valuable shades of salmon and red coral. Clearly, dyed white coral is a genuine material, however, it is not natural because it has been treated with dyes. APPROX 4-6 CTW. GENUINE NATURAL CORAL EARRINGS. WHAT A GORGEOUS PAIR OF FINE EARRINGS! AND IN VERY GOOD CONDITION! IN 14K SOLID YELLOW GOLD. STAMPED 14K. Double your traffic. EXPENSIVE WHEN NEW.NOW A BARGAIN FOR YOU! Each Coral size: 7mm wide and 9mm long. Stamp: 14k. Earrings size: 10.40mm (approx. 7/16") wide and 11.15mm (approx. 7/16") long. Earrings weight: approx. 2.2 grams. Coral size: 8mm wide and 10mm long. Main Stone Coral. Stamp: 14k. Style Stud. Earrings size: 9mm (approx. 3/8") wide and 10.75mm (approx. 7/16") long. Earrings weight: approx. Salmon Pink Color. 2 Natural Genuine Coral Long Tear-drop. Dangle Length: 35.0 0mm. 14K Yellow Gold. We will make every effort to accommodate thisrequest if possible. for over 18years ! This is a beautiful pair of coral earrings. They are made out of (tested) 14k solid gold with 14k butterfly backings. They weigh together a total of 0.72 grams. The coral is a beautiful warm orange pink color - their color looks softer in different lighting. Pretty stud earrings, each featuring one 2.5mm real Coral gemstone, which has been claw set in a solid 9ct gold snowflake design. 9ct Gold Coral Stud Earrings. Supplied in a luxury gift box. This does not affect your statutory rights. 9ct Gold Coral and Cubic Zirconia Stud Earrings. Pretty stud earrings featuring 3mm cubic zirconia and 5mm real Coral balls. Supplied in a Luxury Gift Box. This does not affect your statutory rights. 17mm Coral. S olid Sterling Silver. Each Coral size: 6mm wide and 7.9mm long. Stamp: 14k. Earrings size: 6mm (approx. 1/4") wide and 14.50mm (approx. 9/16") long. Earrings weight: approx. Diamond: 6pcs. total weight 0.06ct. Stone: Genuine Red Coral Sponge. While we do every thing we can to minimize problems. The earrings are studs and closures are push backs. Coral size: 8mm wide and 10mm long. Stamp: 14k. Earrings size: 9mm (approx. 3/8") wide and 10.75mm (approx. 7/16") long. Earrings weight: approx. A stunning individually commissioned pair of 18ct yellow gold Coral and diamond 1.92ct cluster earrings. Coral; A stunning natural stone, superb. 15.5 x 11.5mm. A superb electric deep red. Much more vibrant than picture depict. Coral heart size: 8.5mm wide and 8.5mm long. Stamp: 14k. Earrings length: 38.80mm (approx. 1 1/2") long. Earrings weight: 2.1 grams. Get Supersized Images & Free Image Hosting. Coral heart size: 10mm wide and 10mm long. Stamp: 14k. Earrings length: 36.5mm (approx. 1 7/16") long. Earrings weight: 1.8 gram. Get Supersized Images & Free Image Hosting. 9ct White Gold Coral Drop Earrings. Classic natural Coral drop earrings, with a solid 9ct white gold surround. These are real 9ct gold (NOT plated, rolled or filled gold) and are marked 375. This does not affect your statutory rights. Coral size: approx. Stamp: 14k. Earrings length: 30mm (approx. 1 3/16") long. Earrings weight: 2.2 grams. Natural Pink Coral. Solid 14K Yellow Gold. Gorgeous Drop Earrings. Hand Carved and Set. Coral size: approx. Stamp: 14k. Main Stone Coral. Earrings length: 30mm (approx. 1 3/16") long. Earrings weight: 2.2 grams. Main Stone Color Pink. Get Supersized Images & Free Image Hosting. "Natasha Rose Jewellery". Quality Genuine Sterling Silver products. Necklaces ~ Pendants ~ Lockets ~ Fobs ~ Earrings ~ Rings ~ Bracelets ~ Brooches ~ Cufflinks etc. Silver Chains & Luxury Gift Boxes also available. Collectors Coins& Estate Jewelry. Gold Chains. Length 43mm (approx). Weight 2.3g. Item Condition Item is in very good condition. See pictures. Always fast & free unless otherwise stated. THIS IS A SINGLE PRETTY STERLING SILVER SMALL STUD EARRING WITH A SEMI-PRECIOUS 7mm. CABOCHON PINK CORAL STONE IN A FLORAL DESIGN.